It is with great pride that the Texas Social Media Research Institute announces the release of its first issue of The Journal of Social Media in Society. For the past few months, a dedicated team of reviewers and editors were overwhelmed by the response we received for scholars tackling research on social media. Articles from various disciplines sought answers about social media’s connections and implications in our world. In the first issue, you’ll find two peer-reviewed articles. Stephanie Black and Andrew Johnson, both at the University of Texas at San Antonio, look at how employers use social networking sites in the employment selection process. And, Nancy Foasberg, a humanities librarian at Queens College, City University of New York, analyzed online reading communities through three case studies. Rounding out the journal are three reviews of current texts focused on social media. 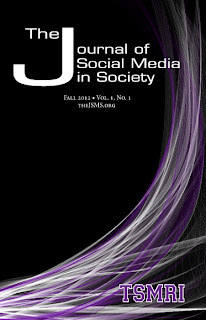 The Journal of Social Media in Society is open access and available for free at www.thejsms.org. If you have research on social media and its intersections with society, please consider submitting to JSMS. We are open to all research paradigms and disciplines conducting research and analysis on social media and mobile technologies. On a personal note, I’d like to thank our editorial team for the time and effort they devoted to launching this journal. Thank you to Credence Baker, Antony C. Edwards, Jennifer Edwards, Yvonne Mulhern, Cristi Horton, Kayla Peak, Alana Hefner, and Justin Carrell. And to two fabulous interns, Hannah Miller and Maylee Friemel, for their talents and willingness to learn on the job. Look for the next issue of JSMS spring 2013. Stay tuned for our call for manuscripts.